In Wisconsin, Arctic char are raised in biosecure indoor recirculating systems. The Bristol-based company AquaTerra has been working with the UW-Stevens Point Northern Aquaculture Demonstration Facility to find the best rearing methods for the fish, and AquaTerra has plans to raise its “Bristol char” using aquaponics systems. 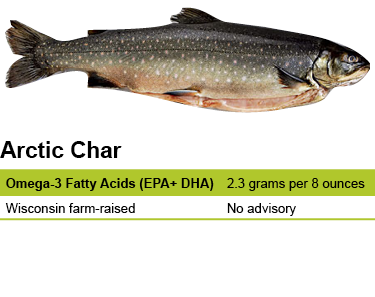 There is no consumption advisory for Wisconsin farm-raised Arctic char. Arctic char belongs to the Salmonidae family, and it is related to both salmon and trout. Its closest relatives are bull trout, lake trout and brook trout, all members of the genus Salvelinus. Although wild Arctic char can be harvested in the northern Arctic regions of North America, Europe and northeastern Russia, the majority of arctic char sold in U.S. grocery stores and restaurants comes from fish farms in Iceland and Norway.